Sizzling steaks, crackling coals and the absolutely divine aroma of food that wafts to your nostrils every time you barbecue and grill is an experience without a parallel; every individual who loves his barbecued steaks and smoky salmons will agree. You need food to survive and you need good food to survive well! Be it your home or a party or even a day picnic, a charcoal grill is a great accompaniment on these occasions. Nowadays there are several charcoal grills that are portable and have an array of features that can enhance the overall experience of cooking in the open. Some of the best memories people have are related to the food they eat; delicious food lingers long in your memory and often when you recollect the delectable taste of a favorite dish you actually start salivating. Grilled food falls into that category of foods that is exciting and is a treat for your taste buds even at the mention of their name. Food which is cooked perfectly maintains the texture, the color and the taste and thereby leaves a lasting impression in your mind. If you are a lover of grilled and barbecued food then you should posses a reliable charcoal grill for those lip smacking evenly browned and smoky flavored meats and fish. Of course you can choose from any of the three major types of grills – gas grills, charcoal grills and the electric grills to make your own steaks and chops. Each type has its own advantages and disadvantages and its own share of followers who swear that the type of grill which they use is the best. The verdict is still open on the debate about which of the three is a healthier choice. But those who love the smoky flavor in their food and the right amount of browning of their meat, fish and even vegetables most certainly prefer a charcoal grill over a gas or an electric grill because these two can just not produce the right flavor that makes the food so special. There are several kinds of charcoal grills available in the market but you should decide on purchasing a product which suits the kind of cooking that you do: some grills do nothing other than grill your steaks and burgers and chops while others can multitask a bit and do additional slow cooking and indirect grilling too. 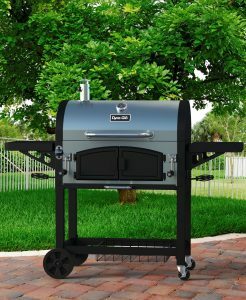 The second factor is the size of the grill; for a small family and the occasional get together a medium sized grill should do, whereas if you are a social animal and can’t spend a single weekend without a party, then you should look at higher end models which are larger in size and also have additional features lacking in a low end model. Finally, the materials used in the fabrication and design play a major role in deciding the cost of the grill: chrome plated, porcelain on steel plated, porcelain on cast iron plated, cast iron and stainless steel grids are commonly used with stainless steel been the most expensive. The Dyna Glo DSN576 charcoal grill has been named in the top charcoal grills in the market and here below is a Dyno Glo grill review that will help you understand why this model is so special. The Dyna Glo DSN576 charcoal grill is an extra sized grill designed for a large cooking area. The grill is 816 square inches and you can cook 30 hamburgers at once on it. There are 4 cast iron porcelain enameled heavy duty cooking grates which ensure that sufficient radiant heat reaches the food and browns it nicely and evenly thereby locking all the natural juices in it. The porcelain coating ensures that cleaning and maintaining the grates is easier than the other material. 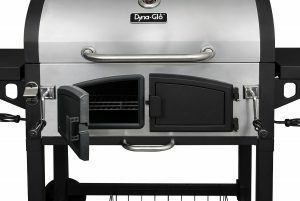 The second most unique feature about this grill is that the removable steel firebox provides two areas for grilling thereby allowing a two zone cooking. That’s not all, the grill comes with two charcoal basket adjustment tray systems which give you greater flexibility in cooking and in controlling the temperature which works in coordination with the built in thermometer to deliver perfectly cooked food every time. This way you can actually cook two different types of food which require different temperatures at the same time, for example you can cook poultry and also make steaks at the same time with this feature. The dual steel doors ensure that you can stoke the fire and add additional briquettes if required to produce the right heat during cooking. The use of steel in the smoke stack also functions as an additional temperature control just like the side dampers that maximize the air flow to maintain the burn efficiency of the coal. Finally, imagine if you couldn’t remove the ash that collects religiously during grilling it will disrupt the entire grilling and cooking process because ash absorbs heat and as a result you will never attain the required temperature needed to grill food. The Dyno Glo is fitted with a removable high grade ash pan that ensures that you have endless hours of maintenance free grilling. For times when you don’t want to miss on juicy conversation you can trust the heavy duty casters and 8 inch resin wheels to move your equipment to where the action is among your friends. The easy mobility and maneuverability of the grill is much appreciated according to several Dyno Glo grill reviews. High grade stainless steel lid ensures that heat is retained in the grid to sear the food while the smoke stack with adjustable flu cap and side vents too monitor the temperature for that perfectly grilled effect. The presence of side shelves, storage baskets and bottle opener turn your grill into a self sufficient mini kitchen where you can store the necessary spices and sauces without having to run to the kitchen each time you BBQ. The eagerness to open a new item and start using it is inherent in everyone but according to several DynoGlo grill reviews, the unpacking of this product is such a herculean task that many users do not even recommend the product to others. It has been stated by several customers that the product is tightly stuck in the box and only by tearing the box they are able to remove the product. This is a negative for those who may want to replace the unit which is next to impossible when the original packing is not present. 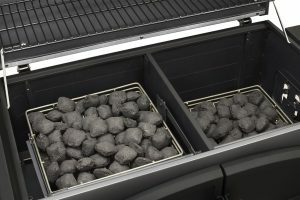 The importance of maintaining airflow in a grill is known to one and all, but unfortunately in the Dyno Glo there is a gap of ¼ between the lid and the plate which makes it very difficult to control the burn rate of the coal. There have also been several complaints that the side vents too don’t close fully thereby affecting the overall temperature of the grill leading to very high heat which invariably chars the food. On the one hand the ash tray is removable and useful but on the other the same ash tray is only 1 inch high which makes it mandatory to empty it every time you use a BBQ – a very cumbersome and tedious process. The hinges used for the cast iron doors are of poor quality and of small size and do not even fit tightly; they also make the whole unit look very cheap and low end. The taste of the food grilled on the DynoGlo is one of the biggest advantages the grill has over its competitors. The porcelain enameled cast iron grates ensure that the juiciness and flavor of the food is retained as there is even heat transfer across the entire grill’s cooking surface. The Dyno Glo grill comes with a one year limited warranty which is lacking in its competitors. The price of the unit too works in its favor. There is no other charcoal grill of this size with these features available at this unbeatable price sold on Amazon. If you are the kind of cook who likes to experiment with temperature and its effect on the resultant food, the Dyno Glo is the one for you because this unit allows you to monitor and experiment with different temperature setting because of the built in thermometer and the charcoal tray adjustment. The added advantage is the ability to stoke the fire during barbecuing without any hassle. A grill which cooks great food but requires laborious hours of cleaning is not desirable and often shunned by people. But that is not the case with the Dyna Glo charcoal grill. Maintaining this product is fairly simple and easy. For the long-awaited BBQ session with your friends and family or the romantic picnic with you loved one, freshly grilled food is a great addition. It is a common perception that when you pay more you get better quality goods; it is true but not in all cases. 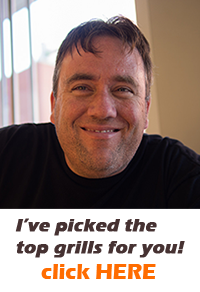 The Dyno Glo grill review surely endorses the fact that you can get great grilled food from a moderately priced charcoal grill. This extra sized charcoal grill with its capacity to grill 30 hamburgers at a time wins its place in any patio or backyard which frequently houses outdoor BBQ parties. Turkeys, beef briskets, ribs, and pork shoulders turn out just the way they should be – juicy, soft and perfectly browned. 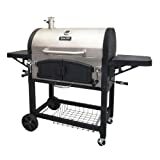 The factors that tip the scales in this Dyno Glo Charcoal Grill’s favor are the ease with which this piece can be assembled; even one who is not well versed with grills can do it easily. Cooking on a charcoal grill requires some experience and patience which is often lacking in some people. These people may find adjusting the amount of charcoal and briquettes required to get the perfectly seared food. With patience and a few modifications everyone can adjust and manipulate the stainless steel lids in a way that the air flow is reduced and it doesn’t hinder the cooking process. Some Dyno Glo grill reviews have stated that the grill did not arrive in proper condition and several screws and nuts were missing or of poor quality. This may be a drawback with the packaging of the product and does not reflect on the performance of the grill. These issues can be addressed to the customer care of the manufacturer and sorted out. The design, fabrication and the material of the grill are in accordance with the price of the charcoal grill. To make great tasting grilled and barbecued food a combination of a good charcoal grill, the right spices and sauces are needed. Hence it is unfair of the users to blame the grill for poor quality food. The porcelain coated grates, the two charcoal baskets and the cast iron doors on the front are all great features of this charcoal grill. And regarding overheating of the grill, by making some simple modifications you can control the heat and even bring it to 250 degrees for slow cooking for several hours. A few tweaks and few modifications and this grill becomes the best charcoal grill that does more than grill available on Amazon at competitive prices. 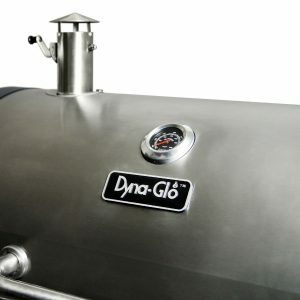 There are very few grills in the market which offer dual zone cooking like Dyno Glo does. The ability to cater to two different tastes and types at the same time too is a bonus that should not be overlooked. Regarding the debate over the use of charcoal grilled food and health, there is a solution to that problem too. It has been found that you can reduce the potential release of carcinogens (as claimed by many health lobbies and the reason to discontinue the use of charcoal grills) when you use garlic, rosemary, olive oil, cherries and vitamin E with the meat. These products reduce the formation of HCAs (Heterocyclic amines) and PAHs (Polycyclic aromatic hydrocarbons) the harmful carcinogenic compounds supposed to be released during grilling of food substances over charcoal. Thus, from the above Dyno Glo Grill Review it can be safely stated that this unit will definitely enhance your culinary skills and will be a welcome addition to your patio for those long days of fun and companionship.